Pictured Penn State pledging brother, Timothy Piazza. 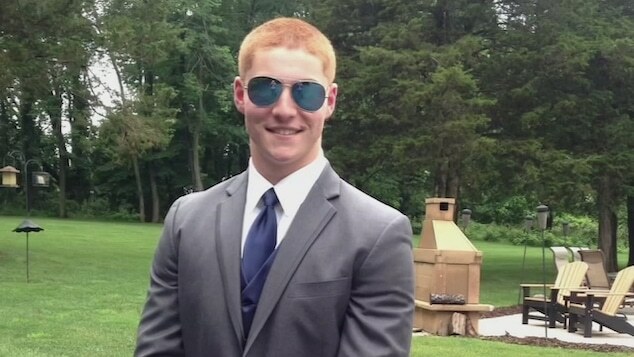 Timothy Piazza Penn State pledging brother hazing death leads to incarceration ranging from 30 days to 9 months for three former fraternity brothers. Two Penn State fraternity members have been sentenced to jail after pleading guilty to charges related to the 2017 hazing death of Beta Theta Pi pledge, Timothy Piazza. Joshua Kurczewski, 20, was on Tuesday given a sentence of six to nine months after pleading guilty to one count of conspiracy to commit hazing, one count of hazing and one count of furnishing liquor to a minor, The Centre Daily Times reported. He was also fined $2,250 and ordered to perform 100 hours’ community service. Judge Brian K. Marshall ordered that Kurczewski’s sentence begin on May 17, one week after finals end, WTAJ reported. A second Beta Theta Pi brother, Michael Bonatucci, 21, was sentenced to 30 days’ incarceration and two years’ probation. Timothy Piazza Penn State pledging brother: Dying slowly in agony in front of his unflinching fraternity brothers. Piazza an engineering student from New Jersey, died on Feb. 4, 2017, after sustaining fatal injuries following a night of heaving drinking and hazing. The fraternity house’s video security system recorded the 19-year-old stumbling to a couch on the first floor before falling down the steps. He was carried back upstairs, and spent the night in evident pain, most of it on the couch, as fraternity brothers took ineffective and even harmful steps to address his condition. Help didn’t arrive for the hapless pledge until the following morning when Piazza was found unconscious in the basement. It took his friends about 40 minutes to summon an ambulance, only for the student to later die at hospital. Medical experts say Piazza suffered a fractured skull and ruptured spleen, with his blood-alcohol level estimated to have peaked at three or four times the legal limit for driving. It was later determined Piazza having consumed 18 drinks over 90 minutes during the drunken hazing ritual. Joseph Sala, 20, was sentenced to three months’ house arrest, nearly three years’ probation, a $1,500 fine and 100 hours’ community service. A fourth student, Luke Visser, also appeared in court but his sentence was not yet known. At one point, a total of 28 members of the now-shuttered Beta Theta Pi house at Penn State faced charges after Piazza death before a total of four fraternity brothers were brought to account. Brothers who often end up becoming the denizens of industry and elite bearers in American society….